My Favorite Gifts – Tris | Faddegon's Nursery, Inc.
Spartina 449’s high-quality stylish women’s accessories make the perfect gift for any fashion lover. From beautifully crafted suede handbags, brightly colored leather wallets and clutches, paired with a trendy matching scarf – you won’t disappoint. Spartina makes for one of my favorite gifts because these accessories are not only functional, but they’re also versatile. Whether your loved one is going out to a black tie event or picking up milk at the grocery store, these pieces make the perfect accompaniment to any outfit. Another fantastic gift idea is the unique paper products we carry made by Cavallini Papers. In a time when most mail is opened on a smart phone, the vintage postcards revive the art of writing and mailing letters. My favorite Cavallini product is the wrapping paper. There’s a variety of playful old-timey patterns that elicit childhood memories. Don’t forget the stickers! If you’re looking to start a tradition with your loved one, I highly recommend any ornament from Old World Christmas. I look forward every year to seeing the gorgeous mouth-blown glass ornaments in all shapes and sizes. Buy a basketball for an NBA fan, a cardinal for the bird watcher or a wedding set for those newlyweds! One gift I love to give (and wouldn’t mind receiving!) is a high-quality scarf. Bundling up in the winter to stay warm might be a necessity but how you do it is a total choice! One of our preferred specials this year is a black knit infinity scarf that goes with absolutely everything. It’s soft and plush, good for keeping warm and accessorizing any look. To really capture the essence of the holidays, I love the Frasier fir line from The Thymes. The fresh woodsy scent fills any space, small or large. Regardless of if it’s a beautiful pine needle glass candle on the coffee table or a sachet hanging in the rear view mirror this scent brings the outdoors in. The scent of a fresh cut Christmas tree is one of my favorite things about the holidays. 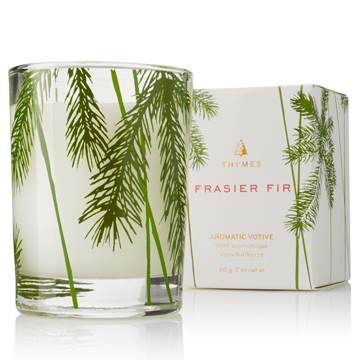 The Frasier fir line by The Thymes captures that fresh woodsy scent perfectly and with a range of products to choose from you have the perfect gift.